Heat oven to 400°F. Grease 9-inch pie pan with shortening. Separate dough into 10 biscuits. Press 6 biscuits in bottom and up side of pie pan to form crust. Cut remaining 4 biscuits into quarters; set aside. In 10-inch skillet, cook ground beef and onion over medium heat, stirring frequently, until beef is thoroughly cooked; drain. Stir in ketchup, mustard, salt and pepper. Cook uncovered until bubbly. Spoon into biscuit-lined pan. 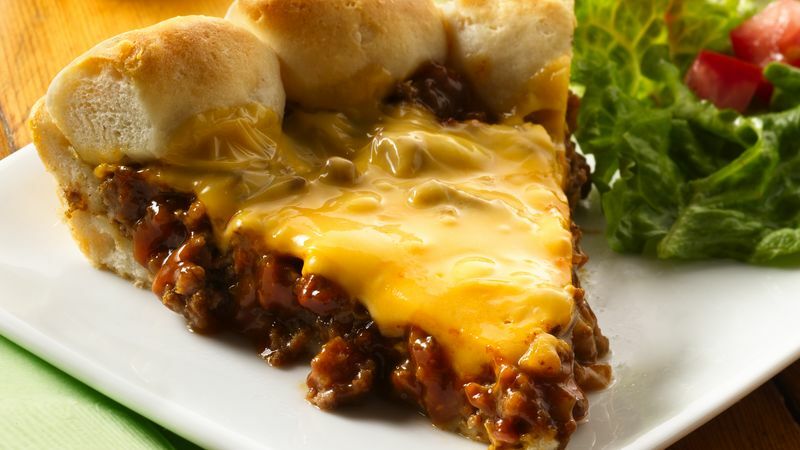 Arrange cheese slices on top of beef mixture. Place biscuit quarters, point side down, around edge of hot beef mixture. Bake 15 to 17 minutes or until biscuits are golden brown.